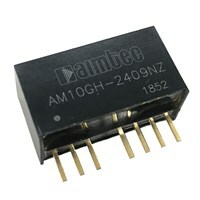 Aimtec adds the AM10G-NZ & AM10GH-NZ 10W series to its SIP8 DC/DC converter family. This new series now increases the power density of our SIP8 line from 9W to 10W. The AM10G-NZ series provides a 2:1 ultra-wide input voltage range while the AM10GH-NZ provides a 4:1 ultra-wide input voltage range (9-36VDC) and comes standard with single output voltages of 3.3, 5, 9, 12, 15 and 24VDC with I/O isolation of 1500VDC. AM10G-NZ & AM10GH-NZ are suitable for applications that include industrial control, grid power, instrumentation and telecommunication. In addition to meeting EN62368 certification, protections for input under-voltage, output short circuit, over-current are also included, increasing the overall safety of your new system design.